Ezra is quickly taken to the hospital after being shot by A; unfortunately, A appears to be following Ezra to the hospital. The liars use Alison as a diversion to get A away from Ezra. Spencer, Emily, Hanna, and Alison are confronted by a horde of As before they hide out in the Fitzgerald Theater. Because CeCe helped her in Rosewood (distracting A while Alison saved Emily), Ali gives CeCe her passport so she can get away. 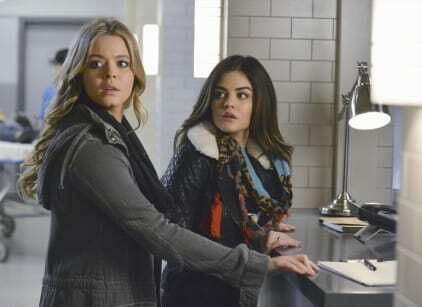 Meanwhile, Aria waits for news on Ezra alone until Shana joins her, supposedly on Alison's orders. CeCe is able to escape police custody and goes to see Alison for help getting out of the country. Ezra finally wakes up long enough to tell Aria that Shana was A, and Aria makes it to the theater just in time to stop Shana from killing all of her friends. Aria knocks Shana off the stage and accidentally kills her. The girls leave but notify the police that someone was hurt in the theater.